Turkey offers Swedish investors vast opportunities for cheap employment and regional access, according to İshak Alaton, chairman of Turkish-Swedish Business Council at Foreign Economic Relations Board of Turkey, or DEİK. It is beneficial for foreign firms to consider Turkey for future investment plans, said Alaton during his meeting with Swedish Trade Minister Dr. Ewa Björling and an accompanying delegation in Istanbul on Wednesday. “While you would pay a minimum 2,000 euros for an employee’s monthly salary in Sweden, you could employ a quality employee for as little as 400 euros in Turkey,” she said. 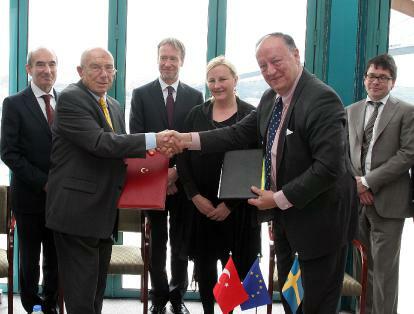 Turkey could cooperate more with Swedish firms in biotechnology, information technology and energy, she added. Turkish immigrants to Sweden have been a successful example of both social and economical integration, according to Alaton. Besides, Swedish firms could plug into Iraqi and Iranian markets through Turkey, he said. Recalling the ongoing construction projects of his Alarko company in Kazakhstan, Alaton said Swedish firms may also benefit from the already established business links between Turkey and Central Asian countries. The total number of nearly 130,000 people of Turkish descent living in Sweden might act as a bridge between the Swedish and Turkish companies, agreed Minister Björling. “We aim to double the total volume of Sweden’s exports by 2015,” he said. Swedish companies were particularly ready to cooperate in green energy in Turkey, he added. Turkish banks performed efficiently during the global economic crisis, said Erik Belfrage, senior vice chairman of Skandinaviska Enskilda Banken, or SEB, told the Daily News. The vice chairman said Turkey has gained a new role in its region, which gives hope about the economic stability of the country. Talking about Turkey’s European Union bid, Belfrage said, “We and Swedish firms fully support Turkey.